2016 Marvel Masterpieces REDEMPTION “What If” Uncut Sheet – In Hand – The Holy Grail Card for your Collection! 1:7,000 Package Odds. You will receive the exact card shown in the photos which includes the entire 1 through 90 “What If” card set it does not include the single card #1 and #81 shown in photo to simply demonstrate the size! 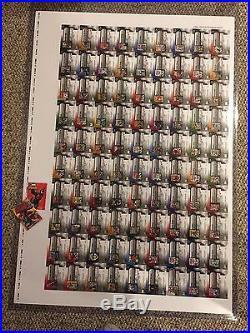 Artist Proof, Uncut Sheet. Card measures 28″ wide x 40″ high (Top Loader measures 29.5″ wide x 43.25″ high). Card is in hand, just arriving from Upper Deck! This is the Holy Grail card that will complete your collection. Card is stored in a gigantic top loader. Card is in NM/M condition and was only available from the Upper Deck by redeeming a scratch off card inserted randomly in 1:7,000 packages. The lowest card odds of the most in demand card parallel “What If” card number 1 through 90! 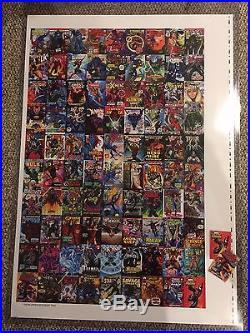 The item “2016 Marvel Masterpieces REDEMPTION WHAT IF 1-90 Set Uncut Sheet Holy Grail” is in sale since Sunday, July 16, 2017. This item is in the category “Collectibles\Non-Sport Trading Cards\Spider-Man Trading Cards\Trading Card Singles”. The seller is “spiderman.super.hero” and is located in Medina, Ohio. This item can be shipped to United States.